Mattress retailer Sleep Experts continues to expand in North Texas, announcing the opening of a new mattress store in Grapevine, Texas. Mattress retailer Sleep Experts continues to expand in North Texas, announcing the opening of a new mattress store in Grapevine, Texas. The location, at 1219 W. State Highway 114, Grapevine, Texas 76051, is convenient to customers in the Grapevine, Coppell, Southlake and Colleyville areas. 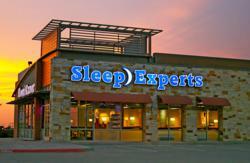 Sleep Experts now has 39 North Texas locations, offering a broad selection of innerspring mattresses, foam mattresses and air mattresses, with brands including Tempur-Pedic, ComforPedic, Simmons, Beautyrest, Kingsdown, Sleep Designs, Comfortaire and iMattress. With a mission to exceed customers’ expectations, the company offers an exclusive One Year Love Your Mattress Guarantee™. Recent accolades include the Greater Dallas Business Ethics Award, five consecutive Consumers' Choice Awards™, and five years on Dallas Business Journal’s Best Places to Work list, ranking 6th in 2011. Sleep Experts shares the gift of sleep with families in need by donating customers’ old mattresses to local non-profit organizations. For more information, visit http://www.sleepexperts.com or call (888) 55-SLEEP.